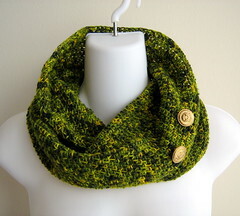 I loved the greens used in the yarn I used for this cowl, I wish I had more but alas I do not. The brass buttons just add an extra bit of awesome. This is a beautiful scarf. I love the color and the brass buttons. Great work! I am totally addicted to scarves and here you are a 'scarf-sister' making more beautiful scarves that I can covet! I love this - it is gorgeous.